up and felt the strangest sensation. A popping feeling, as if someone was popping bubbles in my belly. It happened twice, and no, it wasn't wind, thank you very much. I haven't felt it since, just stretching and pulling sensations as my belly gets bigger by the day but I did give it a poke today and I could swear I got a poke back. It could also have been my own heartbeat. I guess I'll know about it soon enough, then I'll want its feet out of my ribcage, but for now, I'd like a little jab, little fella, just to know you're still swimming round in there! I holidayed in Spain through week 18, turns out a sun lounger is the perfect place for a preggo. Never too far away from water to cool down and make me feel weightless-very welcome right now, copious amounts of food and an afternoon nap. Turns out pregnancy symptoms are very much in line with the holidaying habits of the Brit abroad. The only thing that stuck out was my belly, but I embraced the bikini anyway. Nobody seemed to bat an eyelid and there were plenty of middle-aged men with a more prominent paunch that didn't seem to be worried about theirs. I did roll off of the sunbed and into the pool for some aqua aerobics, on the last day, then immediately wished that I had started sooner! Perhaps I'll start it at home, although I'm not sure my local pool will have quite the same vibe. I was a little more cautious with food in Spain than at home, steering clear of anything slightly questionable, no sushi for me, thanks. I did stick to bottled water over tap, but I still brushed my teeth in it and had ice in my drinks. To quote Mickey Flanagan 'the shits has largely disappeared from the Spanish experience' (if you haven't seen it, you must watch this. Maybe finish what you're eating first). We also lugged my maternity notes along for the ride, just incase. We didn't need them. We've been told to take them everywhere but as is stands all that they seem to say is: this lady is pregnant. Not all that helpful to the Spanish doc. 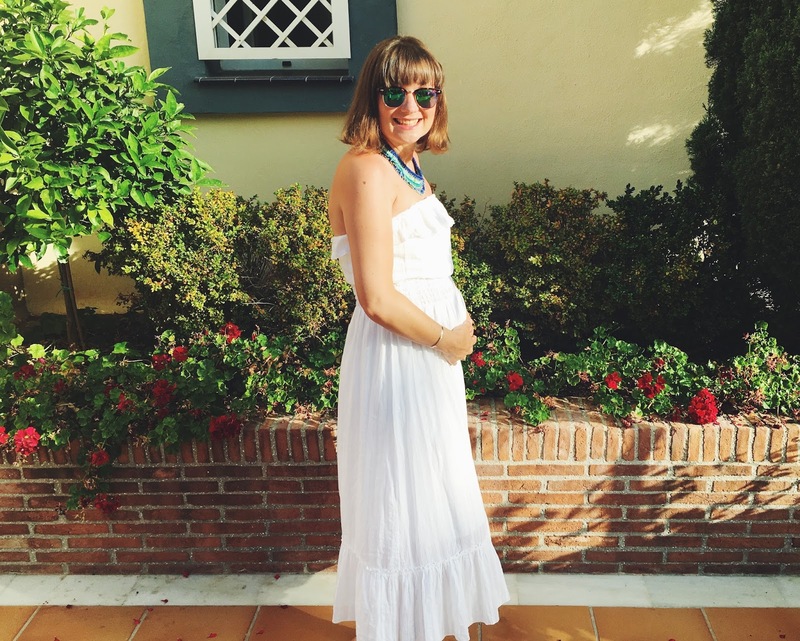 What's your pregnancy holiday style? Embrace the bump in a bikini, or cover up in a stylish one-piece?